Saturday, brought cooler temperatures! I was excited to dress a little more for fall than before. I was not excited to sit on the soccer field in freezer weather and cold wind! But I loved watching my baby girl play soccer! Lucy's team color is yellow so I try to always wear some yellow. 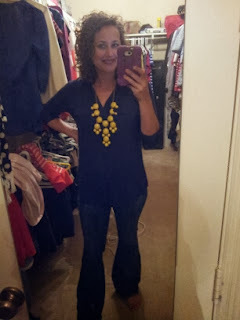 This week I wore the yellow bubble necklace! She was a little disappointed I wasn't wearing my yellow dress!